Prevention:Follow these instructions to avoid concussions! Dr. Grace Walker shares vital tips. Dr. Grace Walker, physical and occupation therapist, shares a few simple tips regarding physical therapy to avoid concussions, as well as advice for fitting helmets. In early days, the use of helmets in many sports originally came about as an effort to avoid grisly accidents, such as fractured skulls and broken necks. While they succeeded in reducing those traumatic injuries, they did little to protect athletes from concussions. What is a concussion? 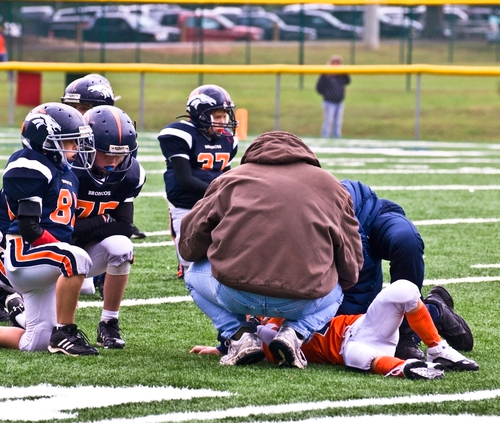 The CDC classifies a concussion as “a bump, blow, or jolt to the head or a hit to the body that causes the head and brain to move rapidly back and forth.” Concussions can be avoided in different ways. One way is through neck strengthening, The Journal of Primary Prevention has published this article covering lack of neck strength and its relationship with concussions. The other is a proper fitting and functioning helmet. Here are some tips to consider when you’re out shopping for a helmet; these pertain to many different type of helmets. Here are three tips to consider when choosing a helmet for your activities. 1. Make sure your helmet fits. Be careful of hair alterations and wearing caps or bandanas underneath the helmet after you have spent the time to have it fitted. 2. Many sports equipment stores and manufacturers are able to give recommendations about what size helmet will fit you by taking simple measurement. Click here to see a fitment video by Riddell football helmets. 3. Buying a helmet is an investment. Don’t go with the bare minimum; your well-being may depend on it. For more information on helmet fitment, see Chris G. Koutures, MD FAAP pediatric and sports medicine specialists blog by clicking this link! At Walker Physical Therapy and Pain Center, we have trained therapists to help design physical therapy programs to increase neck strength, which is a factor in reducing concussions. We come up with personalized programs for each patient to provide results in a fun and healing environment.